I was assigned a family over a year ago where I had to conduct family therapy using a phone interpretation service because the mother with six children was Spanish-speaking (I am not). The mother was also undocumented. After managing to make some therapeutic headway in the first few months, the family struggled to maintain stable housing and became homeless at the start of the summer. This family of seven ended up moving on a temporary basis into one bedroom of an apartment with two other undocumented families. I want to be angry or feel that the mother is ungrateful but I do not feel those things. Yes, I tried my best to ensure that this visit would occur and even gave mom an out by asking her to just text me if she won’t be home. Yes, I advocated for the family to be provided round trip metro cards to our office because I know it would be unrealistic and unfair to expect the family (one mom, six kids) to come on their own. And I wanted her to come to see me for once so we could have a meaningful conversation in a private, comfortable space with the aid of phone interpretation so that her kids do not need to be burdened with being spokespersons and she can feel safe that other families are not overhearing her business. But I also understand that in the grand scheme of all their problems, talking with me isn’t high on her priority list. So what I’m left feeling is sadness. Sadness that really and honestly, there isn’t much of anything I can do for this family in their current situation. I am a family therapist. And while I can and should accommodate the realities of many of our clients in child welfare, I’m simply not equipped to help them with concrete needs. I’m not a housing specialist. I don’t have an array of resources at my disposal to provide undocumented families the necessities they need. Refer them elsewhere. That’s the response. It’s the right move. And yet, it feels so hollow. We all know too well how many families fall through the cracks when they change programs or agencies. After nearly 8 months of working with this family and with the last 2 months of the family being homeless, this sliding down the slippery slope of Maslow’s hierarchy of needs, I can’t help but feel what was the point of all this? “We plant seeds. It’s not about solving their problems but about giving them the tools to face them more effectively. It’s the reality too many undocumented families face,” and so on. None of this gives me solace. I am just tired… and tired of expending more energy on a family that’s really beyond my or my agency’s capabilities. I do acknowledge that there are strengths and some resources present in this mother and her family. But I can say with objectivity I’m not of much use to this family right now. I’m not frustrated or angry. I’m just… Tired. By the end of October, the family eventually ended up in an exceptionally safe and comfortable shelter and I was able to transfer the case to a nearby general preventive program to a dedicated worker who was also Spanish-speaking. I also got to have a very touching termination visit with the mom and children. Language barriers and evidence-based model protocols aside, I figured this was the closest to success I was going to achieve with this case. Then in mid November, I came to learn the devastating news from the new worker that mom had been hospitalized, was found to be terminally ill, and was not going to be discharged. ACS planned to find permanent placements for the children (ages 7 to 13). I broke down. In spite of all the problems and instability, the one constant in the lives of these children was their mother. While mom had grown more weary and drained over the year, the children remained high spirited and resilient. This mom was clearly doing something many things right no matter what her ACS worker said. Unfortunately, this is where their story ended for me. It will be someone else’s job to see the next chapter of their story unfold. I am left mourning the loss of a woman who faced countless struggles and at times made me feel my weariest as her worker, but who unquestionably championed at being a mother. My work with this family taught me that while my role as a social worker may often feel unclear, unsatisfying, and ultimately, not enough, it does not mean the work/effort/connection was in vain. There are not always clear lessons to be learned or closure to be gained. And I am learning to be okay with that. My thoughts are with her children. Social worker/ preventive worker/ counselor/ therapist/ “the lady”… all titles I’ve responded to at my work, and each one relevant in its own way. But these multiple identities also capture the inherent challenges of integrating two professional spheres, one a carefully honed practice, and the other a colossal institution. One often associated with privilege, the other with poverty. On one hand, there is a natural connection between family therapy and child welfare (specifically preventive services). Both are often involved during a time of crisis. Both are concerned with the safety and well-being of children. Both are committed to stabilizing and healing families. And the desire for child welfare to move away from historically punitive and inefficient practices toward ones that are more therapeutic and accountable is both logical and good. On the other hand, there are also competing interests, which have made me wrestle with my own professional ethics as a clinically focused licensed master social worker (LMSW). The power differential in child welfare is much more pronounced than in family therapy alone because of the focus on safety and risk. While all helping professionals are mandated reporters, there is an intrusive (though arguably necessary) element within child welfare that still does not sit well with me. There have been times where the pressure of fulfilling ACS requirements has directly contradicted my commitment to therapeutic rapport, self-determination, and unconditional positive regard in my work with families. That may sound like Social Work 101, but it seems many families in child welfare have simply been denied these experiences. Without them, no amount of training, funding, programming, or research is really going to help families heal and protect their children. However, child welfare does not shoulder the challenges alone. Evidence-based models of family therapy have their own rigidity and time restrictions. And I am not convinced that these models are always in the best interest of families experiencing complex trauma and persisting barriers to basic needs. Having learned that therapeutic approaches should be adapted to the client, it can feel counter intuitive to try to make the client fit the therapy. But I am optimistic that a good intention may evolve into good policy. One thing I have learned so far is that there is a niche of families in child welfare for whom the model of family therapy I am practicing is extremely appropriate. These families often have some interpersonal and environmental risk factors but are also stable enough to address emotional and relational needs. These families do not have the luxury to access mainstream mental health services, but in a time of crisis, come to the attention of ACS. Being able to provide in-home therapy to these families and aid in their healing has made this demanding work worth it. I follow the guidance counselor down the hall as we walk toward her office. I am many steps behind her because I’m looking around slowly, hoping I run into him. I imagine that I would act surprised and he would wave “Hello” and I will tell him how big he is and then I will ask him how he is doing and behaving in school and I will tell him to send his mother my greetings but I am here to see another child and it was really nice to see him. After I leave the guidance counselor’s office, my pace is slow and my eyes search hoping he is roaming the halls and I get to see him even if it is for a few brief seconds. After getting off the bus, I smile remembering that one of the girls started school this year and I try to imagine how she looks in her new uniform and ribbons in her hair. I walk to the next home visit. When I went on maternity leave, I thought the hardest part was over. I closed most of my cases and I said my goodbyes and good lucks. I did not think about what happens after. Having a baby gave me a pause; a way to not think about the ‘I will probably not see you again.’ So, it did not feel so final. As I walk through the Bronx after coming back to work, going from home visit to home visit, I cannot help but imagine how it would be if I see any of my previous clients. I am hopeful. In my mind, I see them happy, I see them well. I see new jobs and good grades. I see children growing. I see better support systems and new ways to cope with stress all which contribute to being less likely to have any future ACS involvement in their lives. I know this is idealistic and optimistic to the tenth power and honestly, it has nothing to do with the work I did with their families. I am not thinking, “Oh my God, I made such a difference in their lives, they are so different now because of me and they will NEVER forget me”. I just hope with all of my heart that they are good. And until I run into them by chance, I will continue to feel like the optimistic observer of the Bronx. August 10th made a full year working for my agency! On that day I remember thinking to myself a bit confused, “I thought I already celebrated a year.” This made me laugh out loud because what I celebrated was 6 months, which at this point seems so long ago. Oh boy, has it been a ride! Looking back at this past year I’ve definitely experienced a LOT, and I’ve had my share of ups and many downs and too many crises and days that kept me working until very late into the night… but somehow at this very moment it all seems worth it. Yesterday I was able to say good-bye to a very sweet 9 year old that I have known since I began my position as a case planner a year ago. She has been in care for over two years now, and too many homes to count. Throughout her experience, she dealt with foster parents requesting her removal for behaviors they neither understand, nor tried to understand. She’s had her share of family members who would rather stay out of the picture, using the word “drama” to describe her situation, and even an aunt who asked me to pick her up one day because her “know-it-all attitude” was too much to handle. Looking back at these situations I was there by her side through all of it. I sat with her through the tears, heartache, feelings of abandonment, and confusion, and it all brings us to this day. At the start of the summer, an uncle came into the picture. He was very proactive. 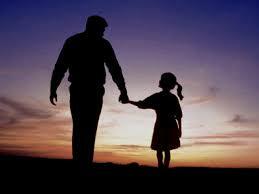 He wanted to truly provide for this child and give her everything she never had- including a stable family. This seemed like the answer, but due to some unforeseen circumstances she could not stay with her uncle for more than a month. Some time passed and after many meetings and court appearances, through persistence and hard work, we managed to cut through all of the red tape and unite her with her uncle. This case has been my most difficult and emotionally draining- moreso than any case ever before. It goes without saying that I am very much relieved and happy to say she has finally gone home. She is out of foster care, and it feels so good to share that. I am definitely going to miss her very much. She said to me today, “Does this mean I’m never going to see you again?” and I almost cried. She gave me a hug and we said nothing else. It feels really good to know that I played an important role in this girl’s life-even if it was for a short while. This is the bittersweet reality of my job though. P.S. In the next few weeks I’ll have a trial discharge to a birth mother that I am so proud of! August has been a good month! 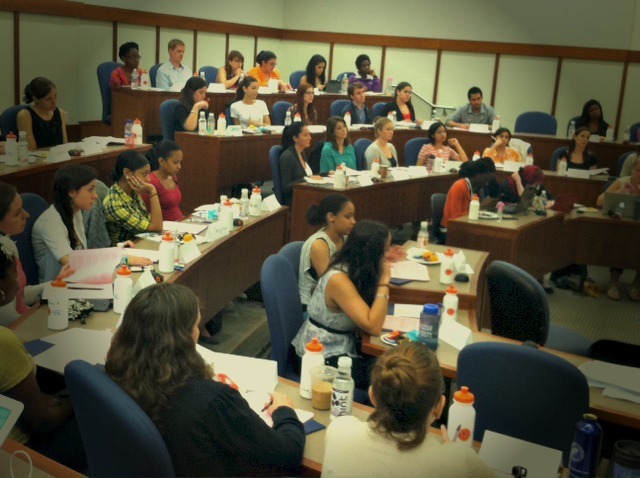 Last week concluded the third #ChildrensCorps Summer Training Academy at Columbia University’s School of Social Work. After five weeks of note taking, lectures from some of the most influential educators and professionals in the child welfare system, role-plays, networking and knowledge-sharing the thirty-eight new members (our largest class yet!) are ready and eager to start work in the field. Some have already begun their two year commitment as early as this past Monday. Similar to the families they will serve, the transition will not be easy. A number of them are acclimating to the New York City lifestyle, claiming their independence, some are starting along a brand new career path and totally changing the pace of their lives. Over the next two years many of them will be faced with some of the toughest challenges of their lives. They will cry, think about giving up, one or two may even decide that this work is not for them- this is a reality. What is also a reality and probably the most important reality, is knowing that every one of them in this process has grown already, and will continue to grow. The seed of their positive thinking will be planted at the agency they work at, and in the families they serve. I heard a mixture of excitement and trepidation at lunch, but the air was light and happy. The room was bursting with their enthusiasm for humanity and their desire to affect positive change in the lives of children and families who benefit greatly from folks with this sort of uplifting demeanor to be a resource for them on their journey through the difficulties of life. 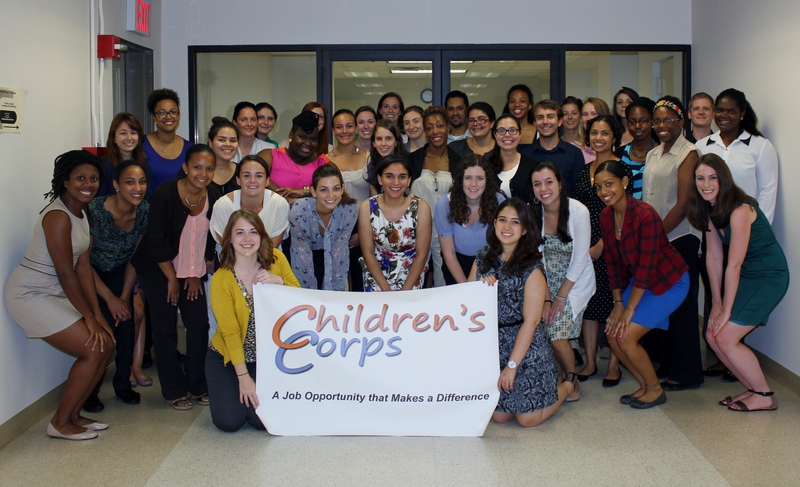 Many of these corps members uprooted their entire lives just over a month ago to move to New York City to fulfill some inner need, desire, or calling for social justice and child welfare. So here they are, after five weeks of unpaid training, about to furnish their new apartments, seemingly entirely at Ikea.